Very often, trial attorneys in complex cases need to explain extremely difficult and elusive scientific concepts to jurors who are not well versed in science. The lawyer’s job is to convey the science correctly to the jury so that they can make a rational decision – yet not to bury the jury under a blizzard of scientific terms and concepts that they will never understand. The answer is to use visuals in the form of photographs, schematic diagrams, animation, timelines, demonstrative evidence, document call outs or whatever is suited to the situation, and to explain them in terms that jurors who are not specialists in the scientific subject can understand. Analogies (in other words, what is something like? ), contrasts (how is something different from something else? ), and simple definitions (what are the components of an object? how is it used?) are very useful tools for the trial lawyer. The brief movie below shows how restenosis (the formation of new blockages at the site of an angioplasty or stent placement) can form in blood vessels when a non-drug-eluting stent (one that does not contain an anti-stenosis drug) is used by a heart surgeon. This is a highly technical medical subject, yet after seeing the presentation, jurors will understand how stents work and why such drugs are used. Just months ago, this A2L Consulting animation and others like it helped a long-time client win the 6th largest patent litigation verdict in history totaling $593,000,000. 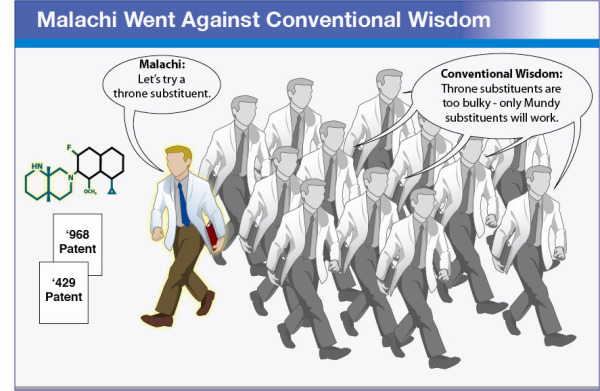 Below, we created a very straightforward, highly memorable patent litigation graphic that shows one person walking his own path, away from conventional wisdom, to show that an inventor’s idea was unique and non-obvious. Similarly, we have devised a 78-second video presentation that details the challenges of inbred reproduction, and the advantages of hybrid reproduction, in the corn plant. This is easily understandable to a juror, even one who does not have a background in biology or food science. 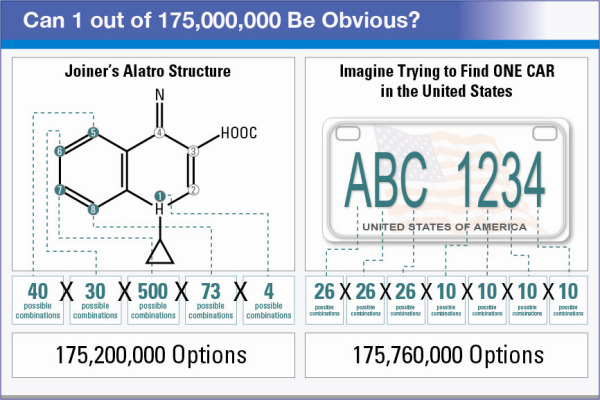 Finally, the schematic diagram below uses the excellent analogy to the letters and numbers in a license plate – an object familiar to jurors – to indicate how many possible structures of a chemical compound can exist and thus how the one structure designed by a client was not obvious and therefore was deserving of patent protection. As Matthew Weinberg, CEO of the scientific consulting firm The Weinberg Group notes, "Successful litigation relies upon a strong science story. An expert who can explain the science easily and clearly makes a difference. Juries want to understand the science and can be helped by an expert who makes it interesting and believable." We believe that no scientific concept is too difficult to teach to a jury. In our 16 year history, we have found a way to successfully teach and persuade about everything from the genetic development of cancer, genetically modified corn, stem cells, physical separation in patented pharmaceuticals, metal fatigue, the transportation of air, water and ground pollution, DNA, bioequivalence, how allergies work, epidemiology, physics, chemistry and countless applied science medical principles. With the right combination of trial team, trial consulting firm and expert consulting firm, any concept can be made understandable by combining a good explanation and a good visual.